This winter discover the enchanted, sparkling world of Christopher Hampson’s Cinderella at the Theatre Royal Glasgow in January 2019. The ultimate spectacle. Coming to Glasgow’s Theatre Royal from the 4th January to 12th January 2019. Primary colours that burst out of the darkness. Billowing ball gowns whisking you into a magical world. 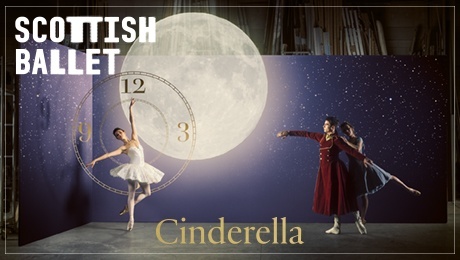 And Prokofiev’s irresistibly melodic score showing well-loved characters in a whole new light – performed live by the Scottish Ballet Orchestra. In her grief, the young Cinderella plants a rose at her mother’s graveside. When her father remarries, the future seems bleaker than ever. Her wicked stepmother is intent on pushing aside kind and beautiful Cinderella in favour of her two nasty step sisters. The course of true love never did run smooth but Cinderella does meet her prince and romance blossoms.